Her testimony came during a U.S. Senate subcommittee hearing in Washington, D.C., on a proposed bill that would help facilitate the return of long-lost pieces of art to their rightful owners. 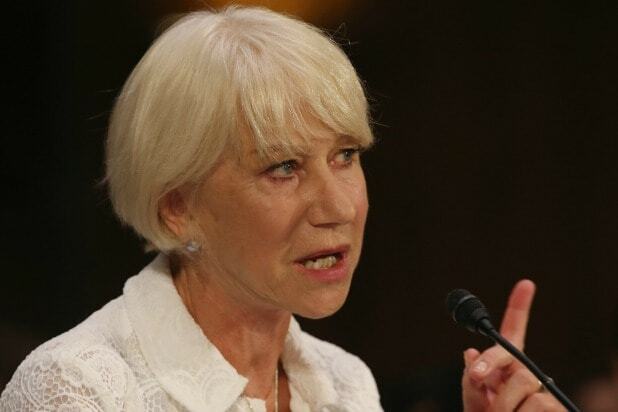 Still, at one point during the testimony, Mirren fumbled with the microphone and called herself an idiot before regaining her composure. Sen. Chuck Schumer, a New York Democrat, said “Woman in Gold” had inspired him to co-sponsor the legislation with Texas Republican Sens. Ted Cruz and John Cornyn. “It is a drop of justice in what was an ocean of injustice,” Schumer said. Cruz took the opportunity to compliment Mirren on her role as Elizabeth II in the 2006 movie “The Queen.” “Marvelous film,” he said. Ronald Lauder, the billionaire cosmetic mogul and chairman of the World Jewish Restitution Organization, also testified. “This was the dirty secret of the post-war art world, and people who should have known better were part of it,” Lauder said. Art experts from Christie’s auction house also testified. It is estimated that the Nazis confiscated or misappropriated tens of thousands of works of art throughout Europe during World War II.